A very sad photo of an elderly homeless man huddled outside a shopping centre in a bid to shelter from the freezing temperatures brought on by Storm Emma has seen the good people of Birmingham rally round to help out to help try and get him off the streets. The man who is in his 70's and was all alone cut a solemn figure in the freezing cold. Jo Bialan posted the above and then the image went viral and thankfully the authorities acted on this. 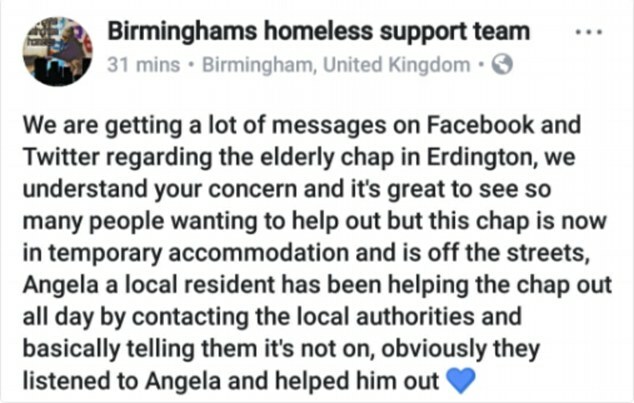 Birmingham Homeless Support Team praised people getting involved and said it was this determination that led to a home being found for the homeless man. Thankfully something was done but too many people still live on the streets and especially our veterans. Click here to Sign up if you agree this is wrong. Read: "Sick of BBC and Mainstream Media Bias? You are not alone!" Read: "SICKENING Halal torture caught on Secret Camera"